Their questions are the most similar in language and difficulty to the real test. They explain the motivation and identify trick words in the questions. They tell you why the right answer was right. They tell you why the wrong answer was wrong. They tell you the reference pages in the guide for further reading. I'm definitely recommending them as a study tool to my friends/colleagues that are getting their PMP certifications. Hello! I‘m Cornelius Fichtner and I’ve been a Project Management Professional (PMP)® trainer since 2005. And all this time, my students regularly ask me this question here. Am I ready to take the PMP® Exam? Answering this question is easy with the PM Exam Simulator™. In particular, there are five features within the Simulator that help you make a clear assessment to understand whether you are ready or not. They are statistics that enable you to aim for an informed target score. The ability to identify and focus on your educational gaps. The fact that you are learning from high-quality questions and explanations. An integrated system that allows you to ask questions and get help when you need it. And the power of experiencing all of these in a realistic online environment. Let’s look at these one by one starting with the statistics that enable you to aim for an informed target score. 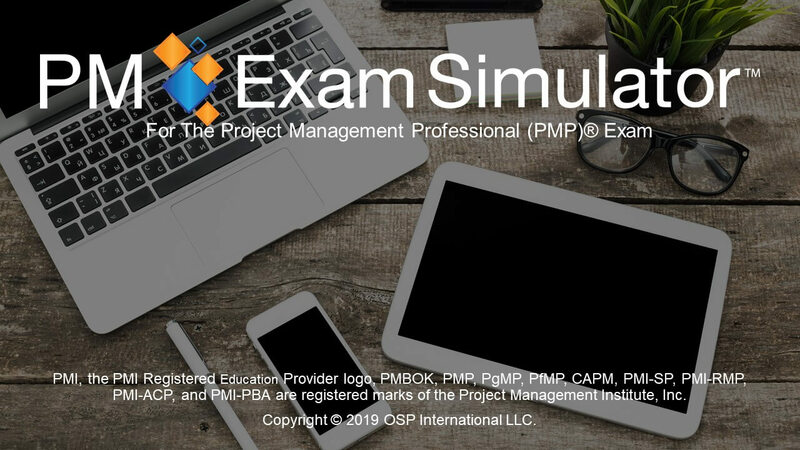 The Simulator includes statistics from customers who have taken and passed their real PMP® exam. The data you see here are from hundreds of students’ surveys and give you clear target numbers. These figures coupled with your own Simulator results let you make an informed assessment about your readiness to pass. However, hitting these target scores is hard for the average PMP® candidate. But as our student, you can rely on years of experience and feedback used to create the Simulator helping you learn and practice so that you can successfully get across. And of course with all that data at your fingertips, we can help you identify and focus on your gaps. Exam reports and detailed statistics present a summary of your performance. There are also statistics aggregated not only by knowledge area but also by each of the five domains. These allow you to identify strong and weak spots so that you can focus and manage your study time most efficiently. Additionally, you can customize your study plan by creating ad hoc quizzes also by knowledge area and domain. Or you can include only those questions that you have previously answered incorrectly. But even more importantly with the Simulator, you can learn from high-quality, realistic questions and their detailed explanations. All questions are written by Certified PMP® experts and they are updated to the latest PMP® Examination Content Outline. Learn from a bank of 1,600 high-quality, realistic questions. That’s seven full exams and one ITTO exam. Learn from both the general high-level explanation, as well as the detailed choice explanations to understand the rationale behind each question and its correct answer. And if at this point, you still want to reach out and ask for help, you can contact us using the Live Feedback feature. With Live Feedback, simply click a button and ask for help on any question in the Simulator. A certified trainer with many years of experience will respond in writing usually within 24 hours. All together, The PM Exam Simulator features deliver a realistic online environment to help you prepare. Our simulated exams mirror the experience of taking the real exam. Features such as the Countdown Timer, Mark for Review, and Text Strikeout all prepare you for what you will actually experience. And we also have the Review Grid. This grid allows you to see an overview of the questions that you have or have not yet answered. The screen layout and functions mimic what you will see in the testing center and our customers regularly say that The PM Exam Simulator™ questions are very close that they had on their real exam. Your ability and confidence will improve with every simulation so that you’ll be prepared to pass the exam on your first attempt because after all, there is no better feeling than seeing the words “Congratulations! You passed!” at the end of your PMP® exam. And if you are not satisfied for any reason then we offer a clear money-back guarantee.